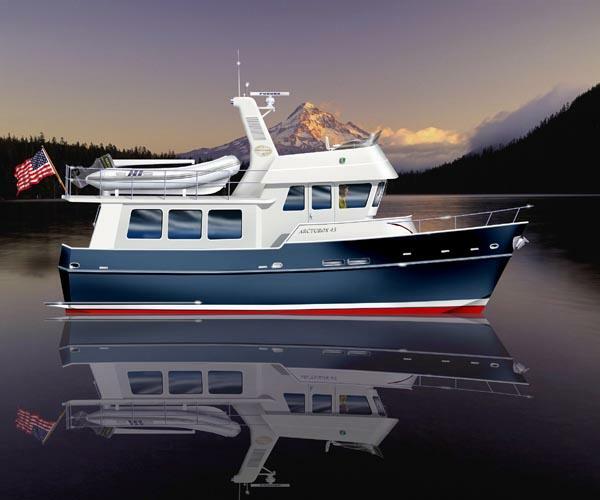 Boat Description The Arcturos 43 by Taylor Bay Yachts is the cruising couple`s home on the water. On the flybridge, with its full helm instrumentation and generous lounge seating, you and your guests will enjoy the vistas of the great outdoors. Taylor Bay Yachts has gone to great lengths to insulate and isolate sound and vibration with the latest technologies. To make your long voyages more relaxing and pleasurable, your Arcturos 43 is stabilized. For ease of handling in tight quarters your Arcturos 43 is equipped with hydraulic bow thruster and can also be equipped with an optional stern thruster. The well-lit engine room is spacious with over five and half feet of headroom. All equipment is laid out for effortless operation and ease of service. Your Arcturos 43 can be equipped with an optional generator, workbench and tool storage drawers. The entire space is clad in heavy sound deadening blankets and covered with epoxy coated perforated aluminum sheeting for durability. Cabin Accommodation The master stateroom boasts a queen-size bed with built-in drawers, spacious wardrobe closets, nightstands, bookcases, LCD television and ensuite vanity. The VIP guest stateroom boasts a centerline double bed, hanging closet, nightstands, LCD television, and ensuite vanity. The master and VIP staterooms share the generous size shower and home-style toilet. Both staterooms abound with an intelligent and well-organized use of all available space. Large built-in drawers are found under each bed. The foot of each bed is fitted with an electric ram, making them easy to lift with just the push of a button, opening-up a cavernous space for long-term storage. Deck 1) Teak Deck: Optional 2) Trim: Rails around fore deck, fly bridge, sun deck, walks to be polished stainless steel 1 1/4` diameter 3) All horizontal surfaces on deck coated with non-skid application in final paint process -- Non-skid to slightly darker shade than parameter deck 4) Chocks for mooring lines -- Transom: Polished stainless steel -- Transom sides: Polished stainless steel -- Amidship: Polished stainless steel -- Bow: Polished stainless steel 5) Rub rail: - 4` half round polished schedule 80 marine grade aluminum integral to the hull with stainless steel cap -- Lower rub rail: - 4` half round polished schedule 80 marine grade aluminum integral to the hull with stainless steel cap 6) Polished stainless steel ports in hull as shown on design and build with double laminate of safety glass - ports to be opening 7) Bow roller to accommodate a 110 lb and 60 lb CQR anchors on starboard and port rollers, respectively. Both to be slotted for chain. Bollard behind windless polished schedule 80 marine grade aluminum. 8) Polished aluminum stem plate below bow roller 9) Reinforced base to accommodate Maxell 3500 windless -- Port and Starboard aft winches and amidship winch 12 DC electric with 400 lbs pull. 10) Lewmar # 39640050 hatch on wheel house 11) 2 - Deck hatch in house forward Lewmar #39660050 12) Windshield wiper: 2 - Vetus Pantograph 13) Horns: Electric 14) Wheel house windows: Safety glass windows tempered glass. Front glass forward facing to be 1/2` thick. Side glass to be tempered 3/8` thick. -- All windows to be Taylor Bay Yachts design 15) Saloon windows: Safety glass partial opening, tinted and 3/8` thick. 16) Wheel house doors: Diamond Sea Glaze aluminum sliding doors with window in upper opening section. 17) Saloon door: Diamond Sea Glaze sliding door 18) Transom doors opening inboard. Engine Mechanical 1) 1 - ZFW 220 3.00 to 1.00 Tranmission -- 1 - 1 x 12 volt 270 amp Leese Neville model no 4864JB large case alternator to charge house batteries. -- 1 - 1 x12 volt 35 amp small case alternator to charge starting battery -- 1 - SAE `B` Hydraulic pump drive, PTO -- 2 - Engine instrument panel: Deluxe with instrumentation for oil presure, water temperature, -- voltage, revloution and hour meters with alarms. -- 2 - Engine control levers Morse Teleflex model -- 2 - Control cables to be Morse Teleflex length to suit -- Keel Cooling to be designed to specs 2) 1 - Propeller shaft: 2 1/4 Aquamet 17 -- Taper details: Standard SAE taper 3) 1 - Propellers: Nibral, 36` diameter x 32` pitch starboard rotation 4) 1 - Stern Tube: Aluminum marine Grade 5086 -- Bearings: Rubber cutlass tube at aft end -- Stuffing Box: Drippless 5) Fuel Filters: 1 - Duplex 75-900 - Racor #75-900FGX2 plus engine mounted filters -- Fuel polishing filters: 1 - Gulf Coast Filters F-1 6) Dry Exhaust: 1 - 3` dia. Stainless steel. -- Flexible section: Stainless steel wrinkle belly -- 1 - in line muffler: Cowl model Exhaust cap: stainless steel with slots to deter water -- Exhaust to run through radar mast -- Drain valve at turn of exhaust to drain off water while vessel is unattended. 7) Heat insulation material: Entire exhaust system wrapped with custom exhaust blanket 8) Engine cooling system to filled with suitable mixture of coolant/antifreeze to insure coolant does not freeze for winter shipment 9) Engine Room Blowers 2x Dayton #2C646. Galley Refrigerator: Nordcold, Tundra or Seafreeze equalivant -- Countertops: Hard surface, Granite optional -- Flooring: Mahogany -- Cabinetry/paneling: Mahogany with a satin finish and push button latches -- Stove/Oven combo Force 10 electric or propane. -- Microwave -- Overhead: Individual padded panels secured in place with VELCRO and easily removable for service -- Locker interior finish: finished mahogany.